Final post from our Cambodia trip! 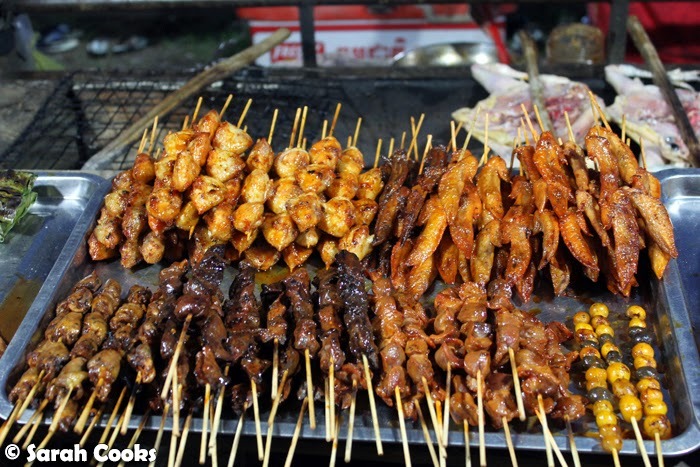 Today imma tell you about the Street Food Tour we took! On our first day in Siem Reap, we visited Pre Rup for sunset, and on the way back to the hotel, our tuktuk driver drove down this incredibly busy long road with stalls on either side. (I later realised that this was the famous "60 Road"). There were lights, there were dozens and dozens of food stalls, selling BBQ, noodle soups, sweets, fruits and more. There were stalls selling clothes and other nicknacks, and there were people. Lots, and lots of people! Walking, cycling, in cars, in tuktuks, in motorbikes... buying food, eating, shopping, hanging out with friends. It looked amazing and so fascinating! We totally wanted to get down and start exploring, but we had no idea where to begin. 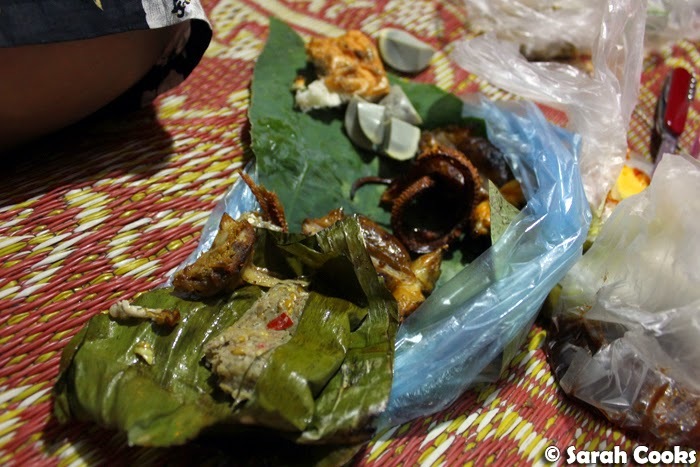 We don't speak Khmer, we didn't know what all the food was, whether or not it would upset our sensitive Western stomachs, and we didn't even have any of the local currency of riels. (Everywhere else we'd visited up until then only used USD). So we resigned ourselves to the idea that this world was cut off to us tourists. 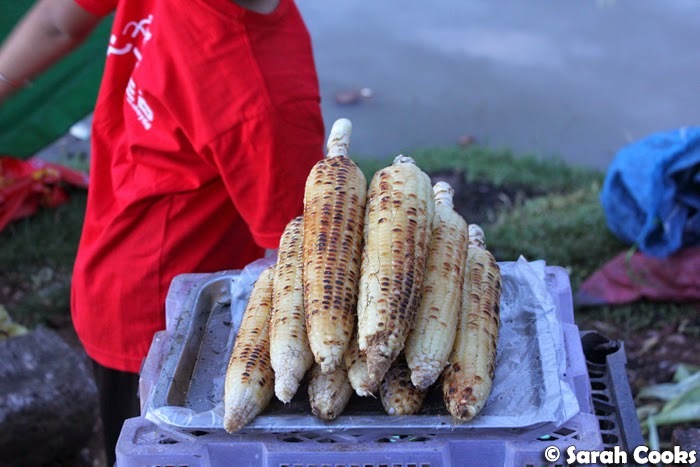 However, when we took that "Cooks in Tuk Tuks" cooking class at the River Garden Hotel a few days later, we saw that they also offered a street food tour which takes adventurous foodies to 60 Road. 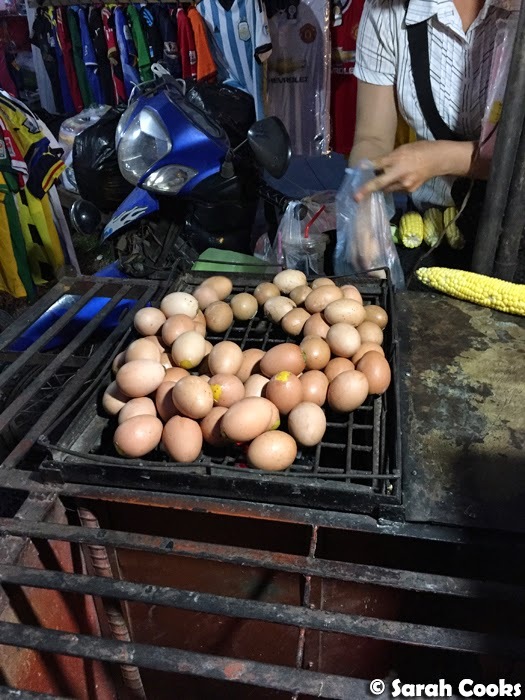 The idea is that you "get to walk with the locals, eat amongst the chaos of the street and experience the unique way the Khmer people enjoy the delights of their Street Food". Perfect! We booked ourselves in for a tour the next day. Deb, the (Aussie!) 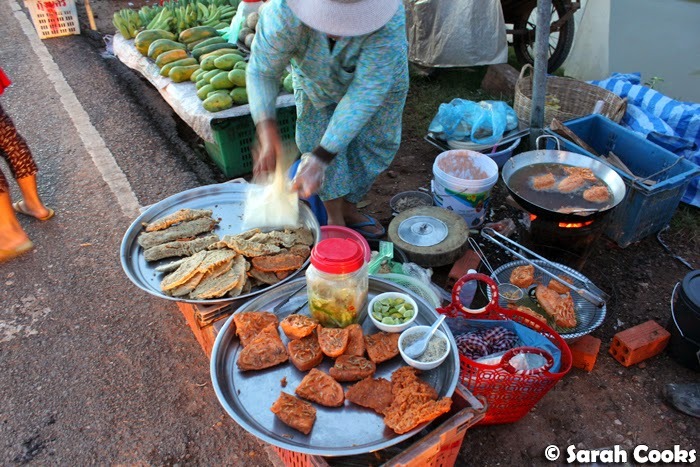 owner of the River Garden Hotel and tour guide, took us to visit Psar Leu Market to pick up a few snacks, then took us to 60 Road, where we wandered up and down the stalls to buy more food, before enjoying it as a little picnic. 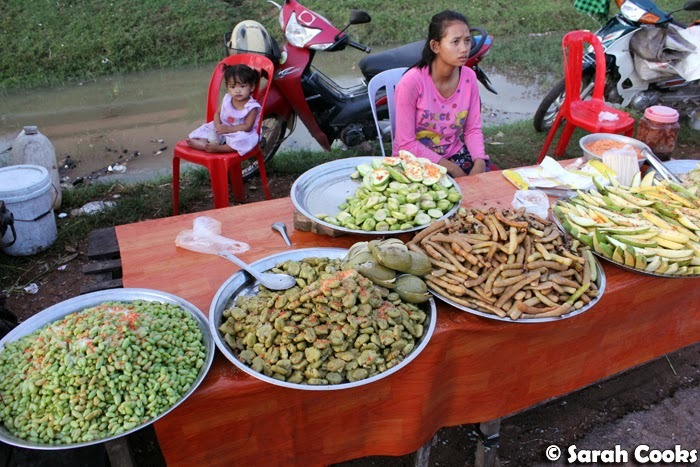 All the while, she gave us an insight into Khmer food culture and explained what the stalls were selling. The food, transport and tour guide were all included in the $25USD price per person. Deb was great, very passionate about Khmer food and culture, and clearly loves living in Cambodia. 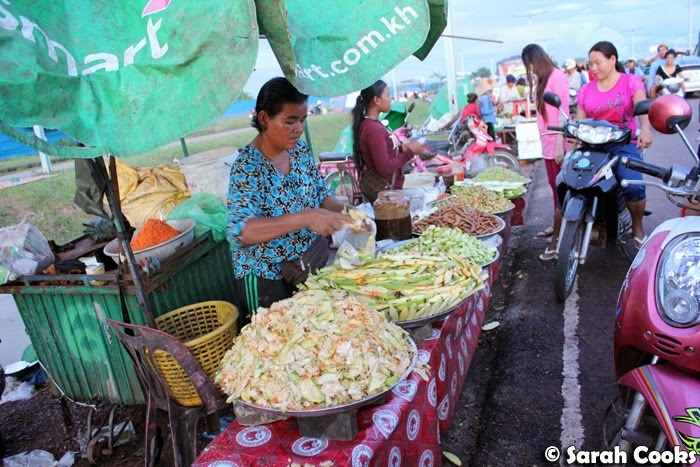 She speaks Khmer and had the knowledge to advise which foods are safer for tourists. (Obviously, she doesn't own these stalls so can't guarantee the quality of every single food item, but she has the knowledge to advise which items are generally safer). 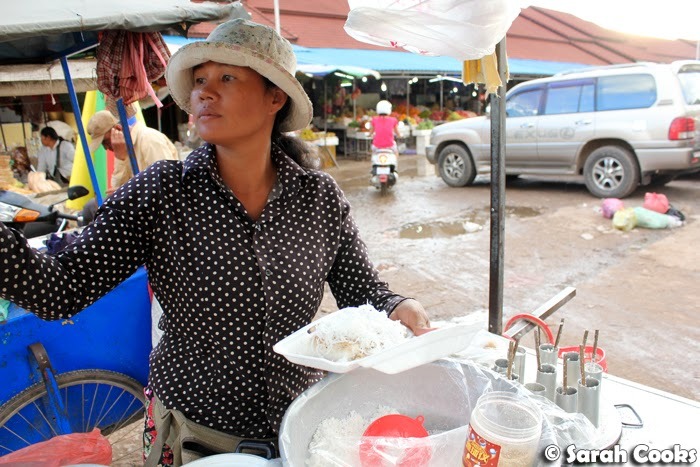 At Psar Leu Market, we started by picking up some steamed rice cakes with fresh shaved coconut, peanuts and sugar to eat later (picture at the bottom of this post). Based on what we ate during our trip, I find Khmer desserts to be very similar to Malaysian desserts - lots of sugar, coconut milk, glutinous rice and peanuts! Deelicious. We also got some of these fantastic fried rice cakes and noodles to eat straight away. 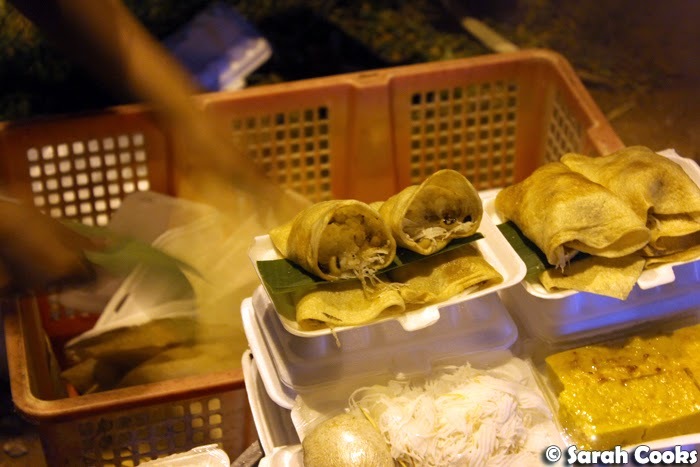 The rice cakes were made of glutinous rice flour, formed into a dough, with chopped spring onions mixed through. The little patties are fried on a hot griddle, and served with a fried egg and hot chilli sauce. The noodles were fat and short, and stir fried with lots of bean shoots. I loved both of these! 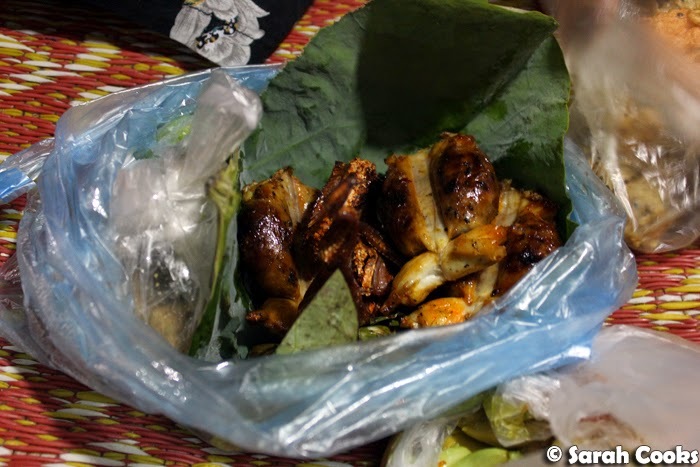 Insects appear to be popular in Cambodia - apparently they're a great source of protein. I wasn't adventurous enough to eat these, but Deb said we should avoid them anyway because she could see they had been refried quite a few times in lukewarm oil. 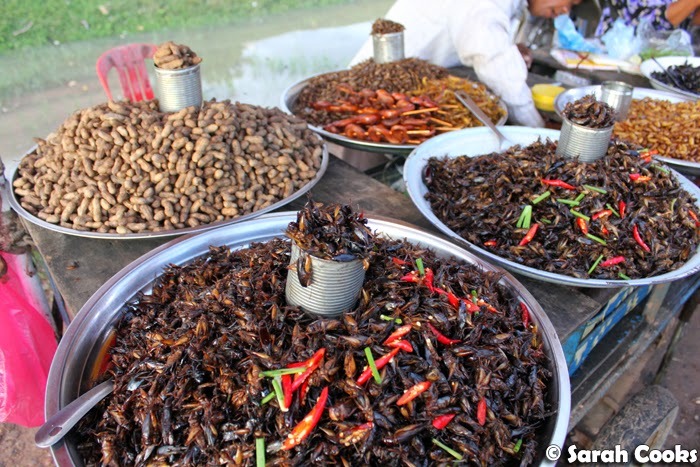 Have any of you eaten insects before? What did you think? I hear that deep-fried grasshoppers are just like crunchy popcorn! 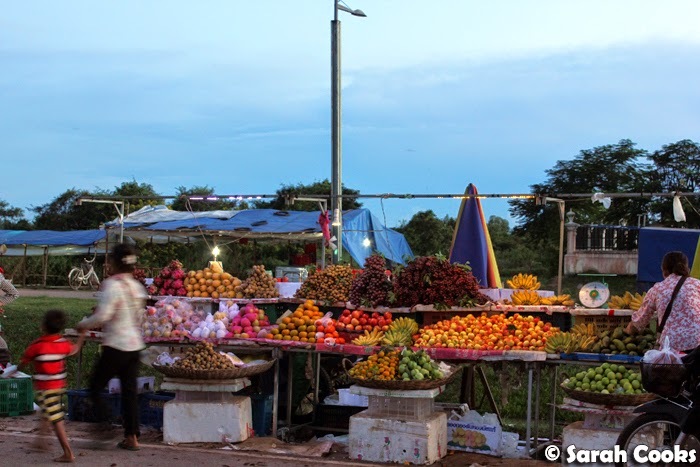 There were heaps of stalls selling unripe fruit, covered with chilli, and sold with a variety of chilli sauces and pastes, sugar, salt and lime juice. We bought a few different ones to try. Below was a variety of corn I'd never tried before - it looks like regular corn but was super chewy! 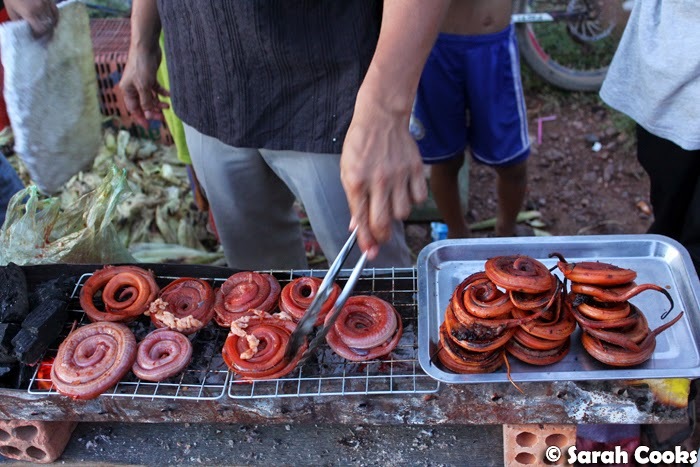 Below we have some grilled snakes, with the intestines popping out as a feature. Deb offered to buy these for us but I wasn't adventurous enough to try, as I found the appearance a little offputting! (I actually had eaten snake prior to this, back in 1997 as part of a Chinese banquet where the snake meat was served, all shredded up, in a soup, so I have no problem with the idea of eating snakes, it was just the presentation that threw me). A bit more "foreigner friendly" were these deep-fried pieces of baguette with school prawns. We bought a piece to try, which came with a lime wedge and a mixture of salt and kampot pepper. (By the way, Cambodian Kampot pepper is The Best! It has such a wonderful peppery flavour and aroma, but isn't harsh at all). 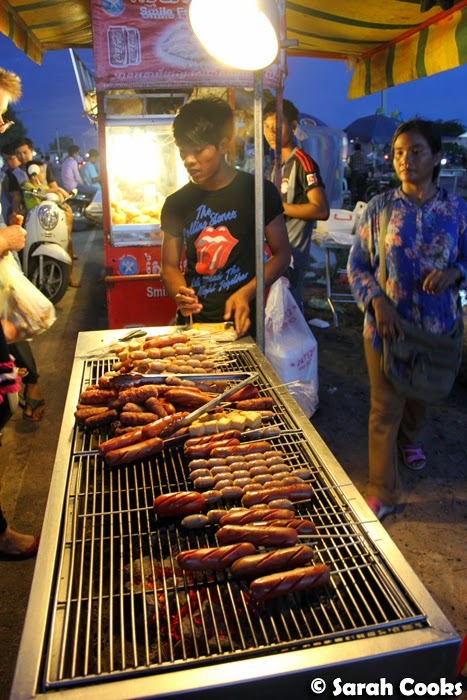 Deb also suggested we try Khmer sausage. 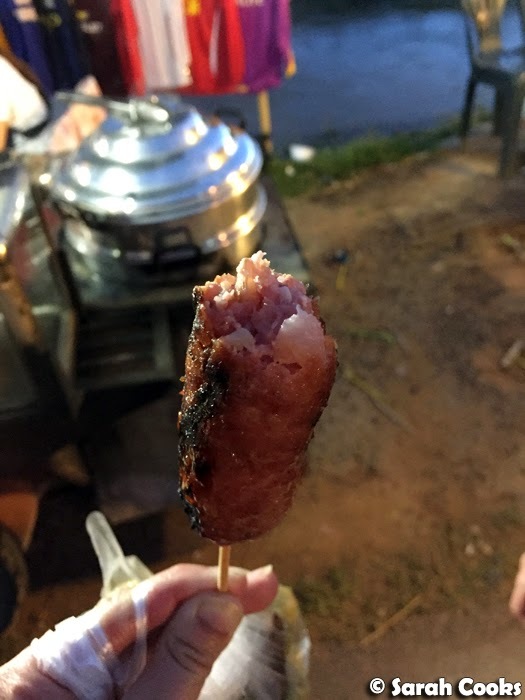 This stall sold a few different varieties of sausage, including kinda normal processed sausages (like frankfurters), but the traditional Khmer sausage to which she was referring was a skinless pork sausage, made with preserved meat. It had a strong, salty and slightly sour flavour. I really liked it. These steamed eggs were a bit of a novelty for us. A hole is carefully pierced in either side of the raw egg, the yolk and white are allowed to come out, and then whisked with salt and pepper. After this, the whisked egg mixture is carefully poured back into the shells and then grilled until cooked. After all of that... it just tastes like a boiled egg! Now we get to what I think is the highlight - the grilled meats! 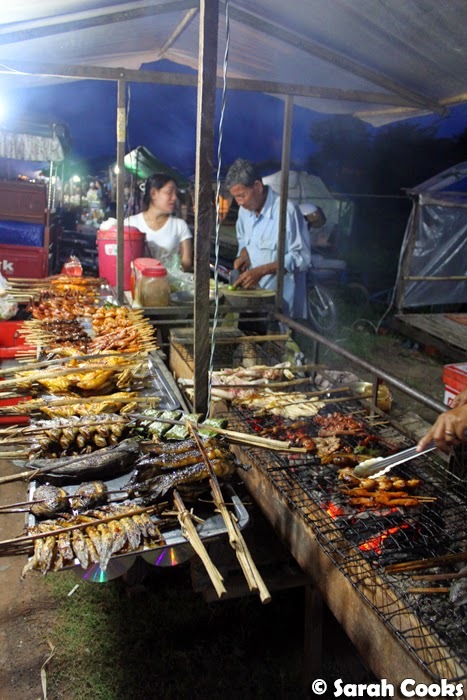 There were dozens and dozens of stalls selling various grilled meats - frog, chicken, quail, fish, and more. Interestingly, all the stalls up and down the road each seemed to sell the same selection of meats. This was a bit of a change for me from the hawker stalls of my hometown of Penang, where stalls tend to specialise in one thing and the good quality ones get really famous and popular. 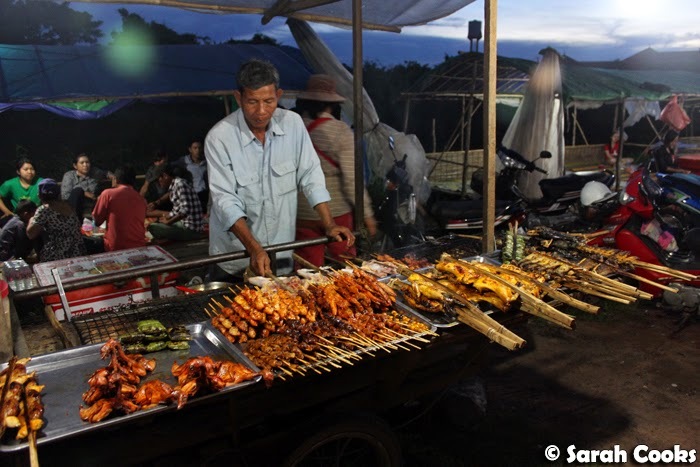 Here in 60 Road, all the barbecue stalls were practically identical. In terms of food safety for our sensitive Western stomachs, Deb suggested that we choose the skewers with the least amount of charring, as the meat tends to get re-grilled throughout the evening and potentially the next day (don't be a judgmental douche; Cambodia is still a third world country), and obviously the skewers get darker with each re-grilling. 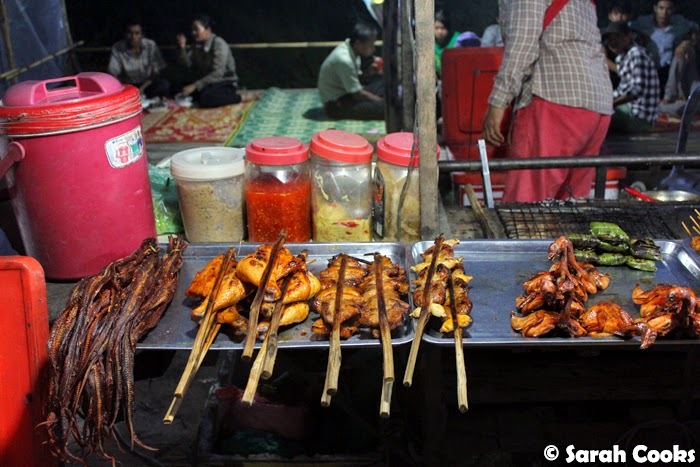 From this stall, we bought two skewers of frog (I've eaten frog before, I have no qualms about eating it), and a barbecued dried snake. The dried snake here looked a bit more like jerky, and less confronting than the barbecued fresh snake we saw earlier, so I thought I could give it a go. Also, when was I going to be eating snake again? Live a little, Sarah! Skewers! With different types of meat, offal etc. Okidoki! After all of that, we took our bags of food to one of the little picnic areas (picnic mats on the side of the road, with thick plastic sheeting as a roof) and got stuck into our food! You can also see the grilled dried snake in this picture, and the grey cubes are pieces of those grilled eggs I wrote about above. (They're grey because of the pepper in the mixture!) Regarding the snake, I'm glad I tried it, but wasn't a huge fan - it was chewy and had a fishy aftertaste (this is because they're water snakes, apparently). Ok, onto sweets! 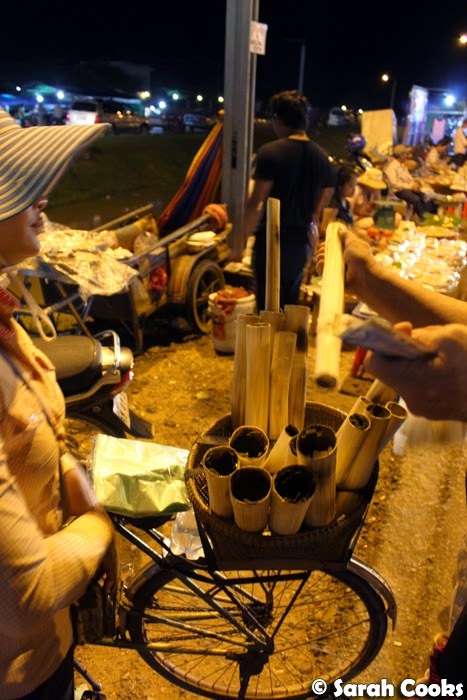 Here are those steamed rice cake cylinders that we'd bought at Psar Leu market. 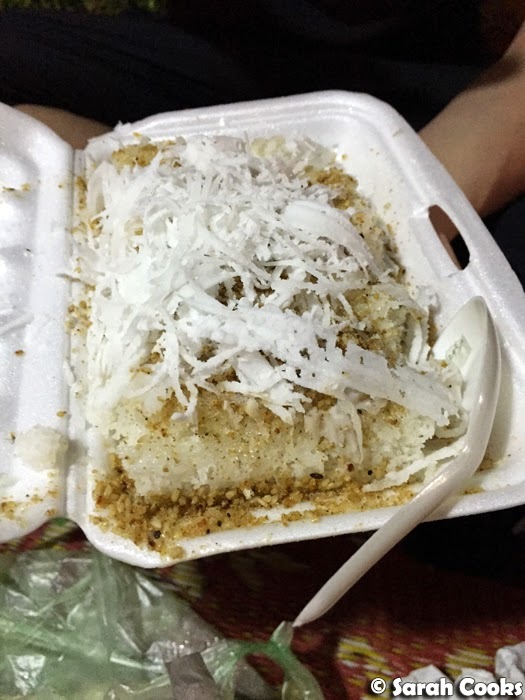 These were topped with sugar, crushed peanuts and fresh coconut shavings. Unsurprisingly, they were delicious. And then we were almost done! We cleaned up, and walked back to the tuk tuk. On the way, we bought these steamed rice stick snacks. They're a mixture of white glutinous rice and beans, unsweetened, and steamed in bamboo. I found these more interesting than tasty - very chewy and bland, when I was expecting (hoping for!) sweetness. But if you want sweetness... there were quite a few cake stalls as well! 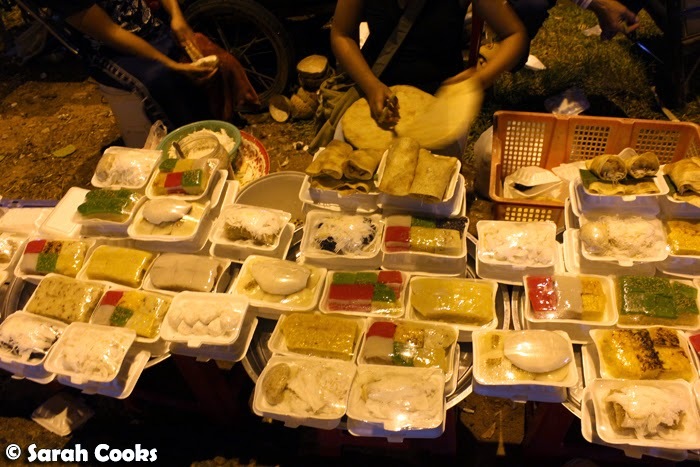 These all looked very similar to Malaysian kuih to me, so I was ok with not trying these, but I was really intrigued by those big pancakes at the back that you can see the lady preparing. These coconut pancakes are a little hard to describe - the outside pancake, served cold, was pliable but still a bit stiff (kinda like a stale prawn cracker in texture), and filled with sugar, peanuts, glutinous rice, beans, and shaved coconut. They were seriously awesome! We didn't try the honeycomb, but I thought it was interesting to share. 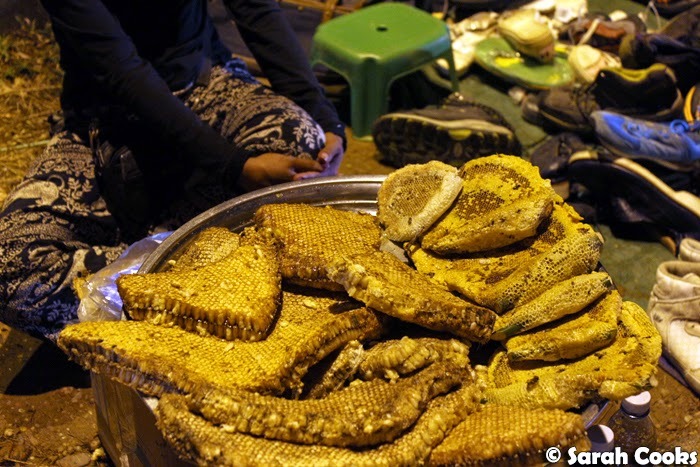 The honeycomb is sold (and eaten) complete with bees and larvae, which are a good source of protein. And that was the tour! We really enjoyed it, and I would absolutely recommend doing it. 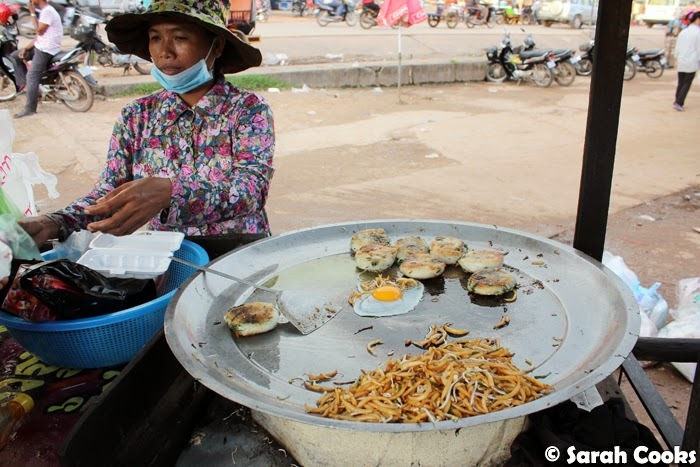 As a food lover, I found it totally fascinating, and it really gave us an insight into contemporary Khmer culture that we certainly didn't see in our hotel or on our temple visits. (Both of which were still awesome, and totally worthy of my precious time and hard-earned money, in my opinion). At the time of our visit, the tour cost $25USD per person including tuktuk pickup from your hotel, tour guide, and all food. See the River Garden website for latest information. 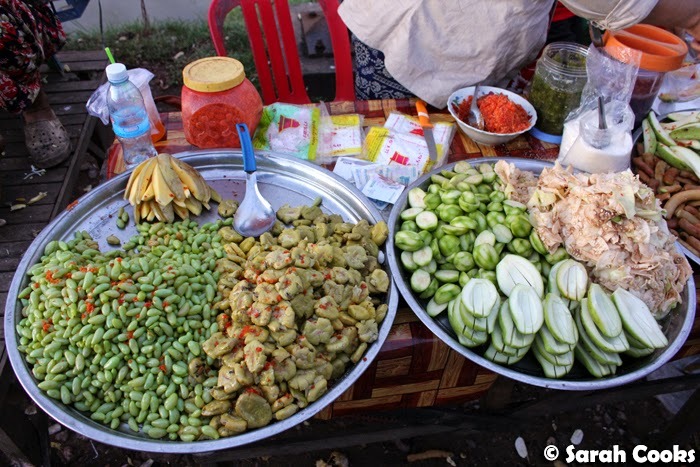 I love the riot of colour in South East Asia - and the incredible street food. It feels like every day is an adventure! The tour sounds like such a no-fuss way to explore it all. Ha, I loved your note about not being a douche. So many people do get judgemental about how things are done in other countries, and don't appreciate that it's just the way people live there! I'm Chinese and love going back to China for visits - the amount of flak I hear from people about Chinese living standards is incredible. It's just incredibly rude.